A man (Daniel Craig) awakens in the desert to find a strange device attached to his left wrist. He has no memory of who he is or how he got there. Only a photograph of a woman lying near by provides any clue to his past. Three men on horseback approach the amnesiac to ask for directions, and spying the device on his wrist assume it to be a shackle. Figuring that the man must be an escaped prisoner they decide to capture him and turn him in for a bounty. Bad idea, as the man makes short work of the riders. It's a nicely staged action scene that wouldn't have been out of place in a classic Clint Eastwood western. Unfortunately it's mostly downhill from there. Craig makes his way to the nearest town where he learns from a wanted poster that his name is Jake Lonegan. He also winds up in the middle of a dispute between the townsfolk and cattle baron Dolarhyde (Harrison Ford) and his people, including his good for nothing son Percy (Paul Dano). Other good actors wasting their talents here include Keith Carradine as the sheriff and Sam Rockwell as a saloon owner, and Abigail Spencer as a mysterious woman who seems to know more about Lonegan than she's telling. All differences are put aside once alien space ships swoop into town and start abducting people. During the assault, Lonegan discovers that his bracelet is really a weapon, and apparently the only weapon that can do any damage to the spaceships. Once the attack is over, he sets off along with Dolarhyde and a posse of survivors in search of the abductees and the truth about his past. Along the way Lonegan's old gang and the local tribe of native Americans also get involved, expanding the cast to unwieldy proportions and dragging down the plot with factional squabbling. Eventually we do get the cowboys (and Indians) vs. aliens battle royale the title would seem to promise, but it's frankly not all that exhilarating. For the most part the humans are so outmatched that there's no real fun to be had watching the fight. The aliens aren't even all that interesting to look at, at least when the camera sits still long enough to let us. They pretty much look like all the other anatomically unlikely aliens in recent movies like BATTLE: LOS ANGELES and SKYLINE, devoid of any real personality or flair. This is what comes of turning creature design over to computer programmers instead of actual special effects artists and craftsmen. 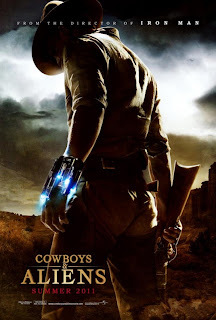 Three writers are credited with the story for COWBOYS & ALIENS, and that's not even counting Scott Mitchell Rosenberg, the guy who wrote the comic book the film is based on. Two of those writers also worked on the actual screenplay, joined by another four writers including Lost co-creator Damon Lindelof. With so many cooks in the kitchen, is it any wonder that director John Favreau couldn't wrangle the resulting mess into a coherent vision? The cast makes the film tolerable at times, and there's some scattered fun moments, but that's about as high as the praise goes. Diehard action and sci-fi fans may get their money's worth at a matinee showing, but even they probably won't remember much of what they've seen by the next day. 2 out of 4 stars.